The RP Photonics Buyer's Guide contains 113 suppliers for fiber optics. Ask RP Photonics for consultancy on fiber optics. RP Photonics also offers the RP Fiber Power software for the design of fiber lasers and amplifiers. Also see our free fiber optics software RP Fiber Calculator. See also our useful tutorial "Passive Fiber Optics"! This explains many aspects of fiber optics using interesting simulations. and various kinds of specialty fibers. Some belong to the important group of photonic crystal fibers (or microstructure fibers), which contain tiny air holes running along the fiber core. Figure 1: Light can be launched into a fiber, where it can propagate with a constant beam radius until it leaves the fiber. One can also combine multiple fiber-optic elements. In all-fiber setups, the light may entirely stay within fiber waveguides. Fibers are often used in the form of optical fiber cables, where the actual fiber is embedded into a supporting structure, which protects it mostly against mechanical stress and moisture. Fiber cables are often terminated with fiber connectors, so that they can be plugged in a similar way as electrical cables, although fiber-optic connections are tentatively more delicate. They can contain different types of fibers, for example single-mode or multimode glass fibers or plastic fibers with different specifications. Cables can contain different numbers of fibers – between 1 and several hundred. They can have different levels of protection of the fibers, e.g. against mechanical damage and moisture. In addition, some fiber cables are fire-retardant. More details can be found in the article on fiber cables. Fiber-coupled laser diodes can be used as light sources for fiber optics. One may also use bulk solid-state lasers or other lasers in combination with a fiber launch system. Fiber couplers can be used e.g. for combining light from different sources into one fiber, or as fiber splitters e.g. for distributing television (cable-TV) signals to different users. Fiber-optic mode size converters can efficiently couple light between fibers with different effective mode areas. Fiber Bragg gratings can be used as strongly wavelength-selective fiber-optic reflectors, e.g. for add-drop multiplexers in telecom applications with wavelength division multiplexing. 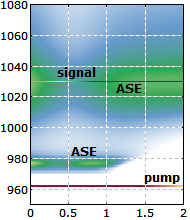 Another application is the introduction of tailored wavelength-dependent losses, e.g. for gain flattening of fiber amplifier systems. Fiber connectors allow one to have removable and reconfigurable connections between fiber devices – similar to electrical connections, although often more sensitive. Fiber collimators provide a connection between fiber optics and free-space optics: they can collimate the output from a fiber, or launch a collimated beam into a fiber. Fiber-coupled Faraday isolators, rotators and circulators can be used for manipulations based on beam polarization. There are various others fiber-coupled components for beam manipulation, such as fiber-optic modulators and saturable absorbers. There are fiber-coupled powermeters and spectrometers for monitoring optical powers and optical spectra. Other devices can monitor the polarization state. One may combine multiple fiber-optical elements to obtain all-fiber setups with complex functionality. For example, one can assemble diode-pumped (fiber lasers, see below) from fiber-coupled laser diodes, rare-earth-doped fibers and fiber couplers. Additional elements such as fiber-coupled saturable absorbers and fibers for dispersion compensation allow one to obtain mode-locked operation, where the laser emits a train of ultrashort pulses. One can also use elements for Q switching, power stabilization, wavelength tuning and various other purposes. 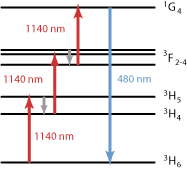 In laser-active fibers, which are in most cases rare-earth-doped fibers, one can perform laser amplification processes based on stimulated emission. The laser-active ions, e.g. Yb3+, Er3+ or Tm3+, are pumped with some typically shorter-wavelength pump light injected into the fiber, and can then amplify some signal light. Fiber amplifiers based on that technology can easily provide a power gain of several tens of decibels. High-power versions based on double-clad fibers can generate average output powers of hundreds or even thousands of watts. By incorporation of reflectors such as fiber Bragg gratings, or by building ring resonators, one can also realize fiber lasers. 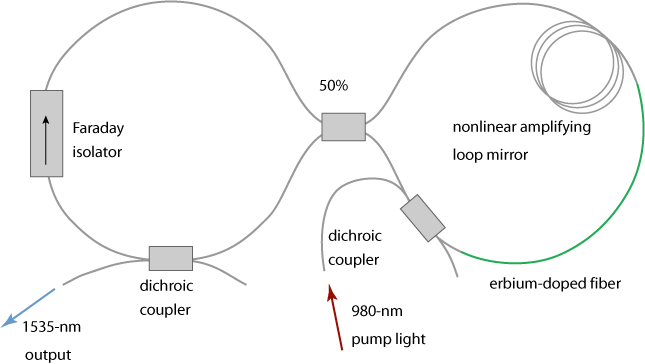 Figure 2: A figure-of-eight laser setup, as explained more in detail in the article on mode-locked fiber lasers. Multiple fiber-optic components are combined to a complex setup. Due to high laser gain, effects of amplified spontaneous emission, the quasi-three-level behavior of typical laser-active ions in fibers, strong gain saturation effects etc., the operation details of fiber amplifiers and lasers are often more complicated than those of bulk lasers. Therefore, detailed laser modeling is particularly important in this area in order to obtain a clear understanding, based on which device designs can be optimized. Traditional bulk-optical setups comprise discrete optical elements such as mirrors, lenses, polarizers, filters, etc., whereas fiber optics may be use to make all-fiber setups. The robustness of fiber-optic setups is an important advantage – but only for all-fiber technology. An important practical advantage of all-fiber setups is their robustness. All components are connected with each other, so that they cannot become misaligned after fabrication. Often, but not always, the contained fibers can be bent or twisted during operation without any detrimental effects. Different parts of a setup can be mounted on parts which are not rigidly connected with each other. As the light is entirely kept within fiber cores and closed optical components, there is no risk that dirt and dust particles can effect it. The higher flexibility of bulk optics is convenient in development, testing and maintenance. On the other hand, a bulk-optical setup is often more convenient during development, testing and maintenance, as one can more easily remove or replace optical components and access beams e.g. in order to measure their optical powers or beam profiles. One can thus more easily identify and cure the reason of faults or optimize single components. Also, one may easily change e.g. the beam sizes within a whole bulk laser setup by exchanging a single mirror or changing its position, whereas such an operation in a fiber-optic setup would require one to replace all or most components. Bulk-optical elements are often easier to procure. A problem with fiber-optic elements is that various additional parameters such as mode sizes, polarization-maintaining guidance or not, type and thickness of protective coating, etc. make it more difficult for suppliers to fabricate all combinations of interest and keep these on stock. Fiber-optical technology can result in significant savings on opto-mechanical parts. Bulk-optical setups often need to contain a lot of expensive positioning equipment (opto-mechanics), and each fabricated device must undergo an alignment procedure which is not always easy to automate. Fiber-optical setups also need fine alignments, but usually only during fabrication, so that there can be large savings on opto-mechanical parts. On the other hand, the required lab equipment for working with fiber optics comprises expensive things such as fusion splicers. Therefore, cost savings with fiber optics are more likely for large quantities, but not for small quantities, as they often occur in optical technology. The article on fiber lasers versus bulk lasers discusses various specific aspects in the context of lasers – among others, influences on the technology on the possible performance of laser devices. Optical fiber communications is perhaps the most prominent example for the enormous importance of fiber optics. Optical fiber communications have become a core technology, allowing the extremely fast and low-cost transmission of mostly digital data for telephony, video and television (cable-TV) signals, computing, etc. The development of the Internet profits enormously from modern fiber optics. This holds not only for passive telecom fibers, which are used for the actual data transmission, but also for additional technology such as fiber amplifiers for compensating fiber losses, fiber couplers for combining or splitting of signals, fiber Bragg gratings for filtering purposes, specialty fibers for nonlinear data processing and various others fiber-optic devices. Glass fibers now totally dominate long-haul data transmission, and even for short-distance transmission in buildings or even within apparatuses fiber optics gains more and more ground. Various types of fiber lasers have become important light sources not only for low-power applications, but even for very high output powers in the domain of multiple kilowatts of average power and megawatts to gigawatts of peak power (at least in conjunction with bulk-optical pulse compressors). They compete with various types of bulk lasers, and depending on many circumstances, one of these technologies may be more appropriate. For more details, see the article on fiber lasers versus bulk lasers. Fiber-optic sensors for quantities like temperature, stress and strain, rotation, chemical compositions etc. have pervaded various fields, including aircraft & space technology, oil exploration, and the monitoring of buildings (e.g. large bridges) and pipelines. Both localized and distributed fiber-optic sensors, based on a wide range of physical principles, are nowadays applied in many fields. Many fibers simply transport light from a source to an application – for example, from a high-power laser diode setup to a bulk laser, from a laser diode to a light-powered sensor system on a high-voltage transmission line (→ power over fiber), or from a high-power fiber laser to a welding robot in a car factory. The properties of the fiber modes depend in non-trivial ways on the fiber designs. Optimized mode structures are often crucial for the performance of fibers. Although many aspects of light propagation in fibers can be described on the basis of modes, numerical beam propagation is often required, e.g. for studying effects of imperfections, bending and other external influences. Also, a mode-based analysis may not be practical in situations with a very large number of modes. The behavior of rare-earth ions in active fiber devices (amplifiers and lasers) is essential for the power conversion in such devices. As extreme conditions in terms of optical intensities and gains often occur in fiber-optic devices, such modeling is tentatively more sophisticated than in bulk lasers. The propagation of ultrashort pulses in fibers introduces additional aspects such as influences of chromatic dispersion and nonlinearities. Note that such effects are particularly strong in fibers due to the typically long device length and small effective mode area. For many such aspects, fiber simulation software is used – particularly for various kinds of numerical simulations. 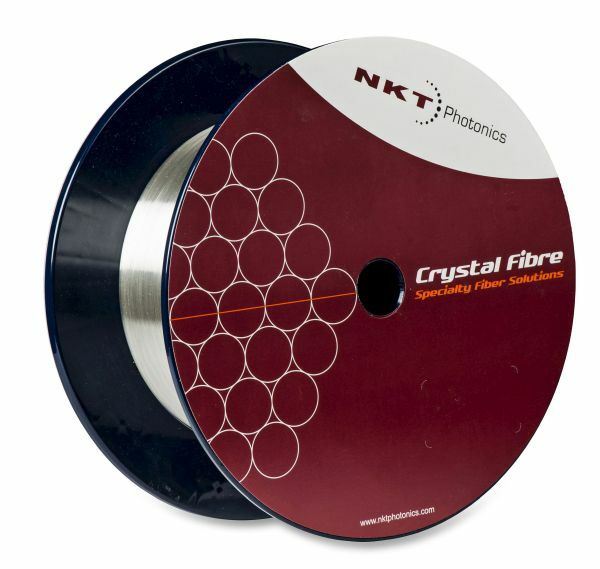 Optical fibers are at the heart of everything we do at NKT Photonics. We utilize our unique PCF technology to embed as many of the functions we need directly in the fibers, making systems built with our fibers simpler, cheaper and more reliable. Our Crystal Fiber portfolio of specialty fibers spans from nonlinear fibers optimized for octave-spanning supercontinuum generation, over the World’s largest single mode ytterbium gain fibers for high power lasers and amplifiers, to advanced hollow-core fibers. Our single-mode LMA fibers are also available as patch cords with standard termination in our aeroGUIDE product range. Moreover, we offer the CONNECT broadband fiber delivery system. R. Paschotta, tutorial on "Passive Fiber Optics"
 R. Paschotta, tutorial on "Modeling of Fiber Amplifiers and Lasers"